Kii Mountain Range has been believed as special area where Gods stay from the mythological times Buddhism which came from China also regardes this thickly forested mountain range as 'Jodo (heaven)', so Buddhist monks have performed ascetic training here to obtain the special power which Buddha has. Thus, three sacred sites and pilgrimage routes were formed and became very influential place for the development of Buddhism in Japan having many visitors from all over the country. The sacred site for Shugendo Yoshino and Omine, which consists of steep mountains reaching altitudes of over 1,000m, is divided into two parts. North of Mt. Aonegamine of the Omine Mountains, which is the water divide of the Kii Mountains, is called "Yoshino" and south of it is called "Omine". Already in the mid-10th century, the status of this region as the most important sacred mountain in Japan had been established to such extent that its reputation reached China. Yoshino that had been the object of the mountain worship from ancient times became increasingly active and influential, received attention largely in association with En no Gyoja. Shugendo, which put importance on mountain ascetic practices, calls walking through the mountains with hard practice 'Okugake' or 'Mineiri', and Omine is the stage for it and became the model of mountain worship sites. Yoshino is also famous for cherry blossom which was planted because they regards the cherry tree as sacred tree. So, Yoshino gives unprecedented cultural landscape in Japan. 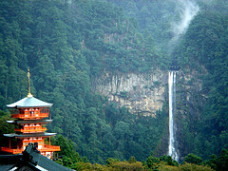 Located at the southeastern part of the Kii Mountain Range, Kumano Sanzan includes the three shrines of 'Kumano Hongu Taisha', 'Kumano Hayatama Taisha' and 'Kumano Nachi Taisha', and two temples of 'Seiganto-ji' and 'Fudarakusan-ji' that are distributed 20 to 40 km apart from each other and connected by 'Kumano Sankeimichi Nakahechi'. The pavilions of Kumano Three Shirines have very unique form and became the standard for 3,000 affiliated shirines all over the country. Koyasan includes 'Kongobu-ji' that was built by Kukai in 816 as the principal stage for esoteric Buddhism on a 800m high mountain basin, 'Jison-in' that was built as an administrative office to facilitate the construction and management of Kongobu-ji, 'Niukanshofu-jinja' that was constructed as a guardian shrine to protect the Niukanshofu estate of Kongobu-ji and 'Niutsuhime-jinja' that is situated in the Amano basin between Kongobu-ji and Jison-in which is closely connected to Koyasan and enshrines 'Koya Myojin,' who legend tells gave land to Kukai when he choose the compound of Kongobu-ji, and 'Niu Myojin', who legend tells guided him, and all of them are connected by the pilgrimage route 'Koyasan Choishimichi'. Having 1200 years of religious history, Koyasan is a mountain top religious city formed by 117 temples, combined with the surrounding steep mountain ridges and deep forests, it produces a cultural landscape related to faith. Especially Okunoin where Kukai (Kobo-daishi) became living Buddha in Heian era and believed still alive, people still continue to build tomb stone together with the belief in Kukai. There are folliwing Pilgrimage Routes which connect three Sacred Sites. The total length is 307.6�q. It is the second world heritage as 'route' following to the Pilgrimage Routes of Santiago de Compostera in Spain and France. 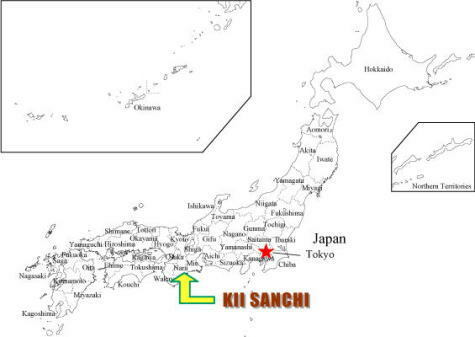 Three Sacred Sites of Kii Mountain Range were different each other at the begining, but by the connection with these routes, Buddhism integrated with Shinto. * Area is very large over 3 prefectures, so the accesses are different by the destinations.